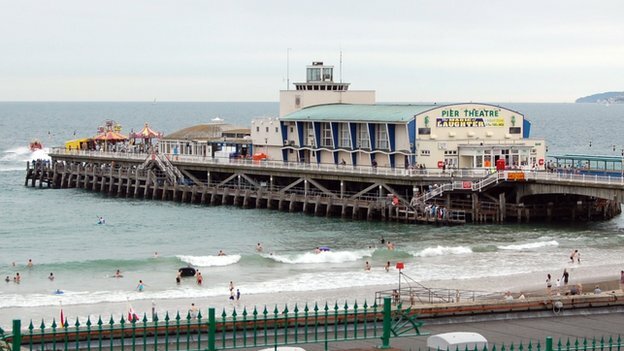 Couples could soon get married on Bournemouth Pier following an application to hold ceremonies there. Bournemouth Borough Council said Key West Restaurant, which occupies the domed building on the pier, had applied to become a wedding venue. The Dorset seaside resort already hosts beach weddings, with 94 couples tying the knot at a licensed beach hut below the town’s West Cliff since 2011. Last week, the nearby Russell-Cotes Museum held its first ceremony. Justin and Sarah Hextall were the first people to get married in the 112-year-old Victorian villa. In November, the council approved plans for a surf wave attraction on the pier and a 245m-long (803ft) zip wire from the pier to the beach. 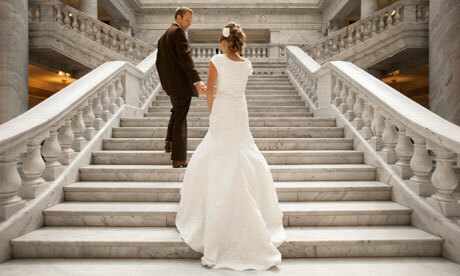 The deadline for objections to the application for weddings is 18 March. Three people have been arrested at a suspected sham wedding in Carmarthen. Police raided the ceremony moments before a 31-year-old Ghanaian man was due to wed a 25-year-old British woman. The Home Office said checks showed the man had been in the country illegally and was due to be removed from the UK. The groom was arrested in the register office raid along with two Ghanaian guests with spent visas who were released on immigration bail. The bride was interviewed by police and released. Immigration enforcement officers intervened at the ceremony after acting on a tip off that the relationship “may not be genuine”. The groom, who had been living in London, has been detained pending his removal. The guests, a woman aged 27 and a man aged 28, will have to report regularly to the Home Office while steps are taken to remove them from the country. 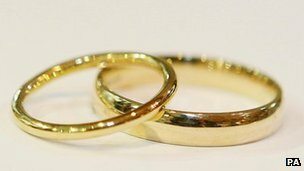 Andrew Hogan, from Home Office Immigration Enforcement, said: “We are working closely with registrars to clamp down on sham weddings and civil partnerships. “This operation is another example of the success that we are having. A wedding service was delayed when an owl bearing rings fell asleep in the church roof. 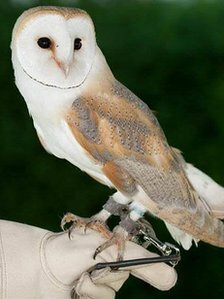 Darcy the barn owl was meant to fly down the aisle at Holy Cross Church in Sherston, Wiltshire, and deliver rings to Sonia Cadman and Andrew Matley. Instead the one-year-old owl flew into the church roof to roost. It took about an hour to get her down. He said the owl seemed “very happy” in the roof and could not be tempted down with a treat. “It must have been an hour before they got a ladder to rescue it,” he said. ‘Absolute stitches’The specially-trained owl had been hired by Ms Cadman for the wedding, which took place at the weekend. It was a surprise for her fiance, who is interested in falconry. Darcy was only trusted with replica rings, with the real bands kept in Mr Matley’s pocket. “The owl was meant to deliver the rings to the glove my husband-to-be was wearing,” Ms Cadman said. “But she just flew straight past the glove and straight up into the top of the church and sat in the rafters. Despite the delay, Ms Cadman said it had not spoilt the wedding day for the couple, who are from near Burford, in Oxfordshire, “in any shape”. “We thought it was funny and the guests were in absolute stitches,” she said. Should have used the services of professional Somerset/Dorset/ Wiltshire wedding photographer www.wessexweddings.co.uk They unlike this owl never sleep on the job. The owner of a Yeovil-based entertainment company was left “stunned” after his firm was hired for Katie Price’s Somerset wedding. Russell Lee, owner of Funtasia Entertainment, provided a chocolate fountain, popcorn cart and photo booth at Friday’s Willy Wonka-themed celebration. Mother-of-three Katie tied the knot with Kieran Hayler during a lavish ceremony at Rookery Manor near Weston-super-Mare. Guests continued the celebrations in the venue’s banqueting hall which was adorned with vases of sweets and giant multi-coloured lollipops. Mr Lee said his company was not booked under the couple’s names and he therefore had no clue of the high-profile nature of his client until the day. “She planned it all in two weeks,” Mr Lee said. “It was apparent that something was going on when they asked me for the names of the operatives to be working on the night. “I only found out for sure when I received a text from an employee as they arrived. “We are always grateful when we are chosen as a supplier for someone’s big day. www.wessexweddings.co.uk covers all kinds of wedding photography. Traditionally, it was the parents of the bride who worried about planning their daughter’s big day. Now it is the children who are being asked to organise their parents’ wedding, in a BBC “reality” show. In Marrying Mum & Dad, children as young as seven will be allowed to spend up to £10,000 on each wedding, picking out bridal gowns and dreaming up surprise themes. The corporation says that it wants to see parents who are cohabiting, those remarrying after divorce, and even homosexual couples taking part, to “reflect modern Britain”. But critics claim that it risks trivialising marriage and gives children a huge amount of responsibility which they may not be able to handle. The series for CBBC, the corporation’s digital channel for primary school age children, will ask children aged between seven and 12 to arrange the character and style of the wedding or civil partnership. They will be asked to oversee as many aspects of the day as they want, from the transport and entertainment to the dress and cake – though they will not be allowed to arrange hen nights or stag parties. Parents on the show will have to be prepared to adapt to youthful tastes. Producers said they were anticipating unconventional ideas, which could see parents walking down the aisle dressed as animated characters, such as Shrek and Princess Fiona. The format will loosely follow that of a successful BBC Three show, Don’t Tell the Bride, in which bridegrooms are given £12,000 to spend on a wedding, on condition that all the plans are kept secret from the bride until the day. In the programme, now in its fifth series, the couples must spend three weeks apart without contact while the groom organises every aspect of the event. Ninder Billing, the executive producer of Marrying Mum & Dad, said: “Marriages are increasingly taking place where children are already in the picture and this is something we can be celebratory about. “Long gone are the days where people are ashamed to be having a second marriage or having children out of wedlock. “We still respect the institution of marriage, but it’s our responsibility to find ways of reflecting modern Britain. In 2010, 46.8 per cent of all babies in the UK were born out of wedlock – the highest level for two centuries, according to a report by the Centre for Social Justice think tank. Experts believe the figure is likely to be even higher among British-born parents, as immigrant couples are more likely to be married. Justine Roberts, co-founder of parenting website Mumsnet, said she welcomed programming which reflected modern families, but expressed concern about the amount of responsibility being heaped on children. The Reverend Rod Thomas, chairman of conservative evangelical group Reform accused the BBC of betraying bias against traditional family values. “There is clear evidence that children who are born to married parents fare better than others, whether it is in terms of health, wealth or education,” said Rev Thomas.